Source Naturals L-Tryptophan, 500 mg, Tablets, 120 tablets I have suffered from insomnia since I was about 11 years old and am now 40. This is the only natural product that I have tried that works! It is not an instant fix rather, it's a cummulative effect. I guess that I really began to notice it's benefits after about one month. Have been able to come off all meds for depression as well as sleeping pills. Have had no side effects and same dose continues to work for depression and insomnia. I started taking the standard dosage (3 pills) of this product earlier this year, and I am now migraine free. It's not that I haven't had triggers -- I can feel the pain coming on and then a tingling sensation, and it goes away. I also fall asleep more quickly and sleep very soundly most nights, but that's gravy compared to not needing to touch my migraine meds in many months now. Works great -- but they're horse-size pills! L-Tryptophan helps both my husband and me fall asleep quickly, even when nothing else will work. Even with intractable cervical disc pain (I can't take any pain relievers, including OTC or herbals because I've developed allergies to ALL of them), this helps me to fall asleep. It doesn't reduce the pain; it just helps me sleep despite the pain. So far, this is the only thing that does that. Great for relaxation and sleep. 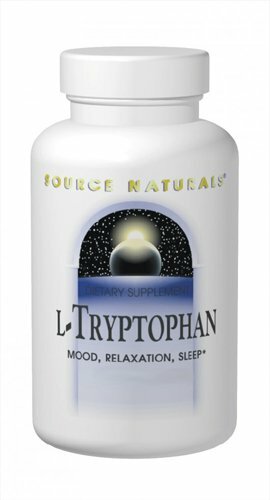 Source Naturals L-Tryptophan, 500 mg.
My experience with Source Naturals L-Tryptophan 500 mg. capsules has been excellent. Follow the instructions on the label and you will be on your way to feeling better. I recommended it to a friend and he also started feeling better, he had used prescription antidepresants before but he wasn't getting good results, plus they had side effects he didn't want. Moreover, they were more expensive. this product does NOT help me fall asleep AT ALL. i tried 3 capsules before bed for a week, even took 3 capsules of valerian root together with tryptophan. nothing. i honestly tried but will have to start taking lunesta, because i can't work on 4-5 hours of sleep.